To help revive the diversity of crops produced and consumed locally, we developed a micro project to produce organic compost through vermiculture and promote home gardens. 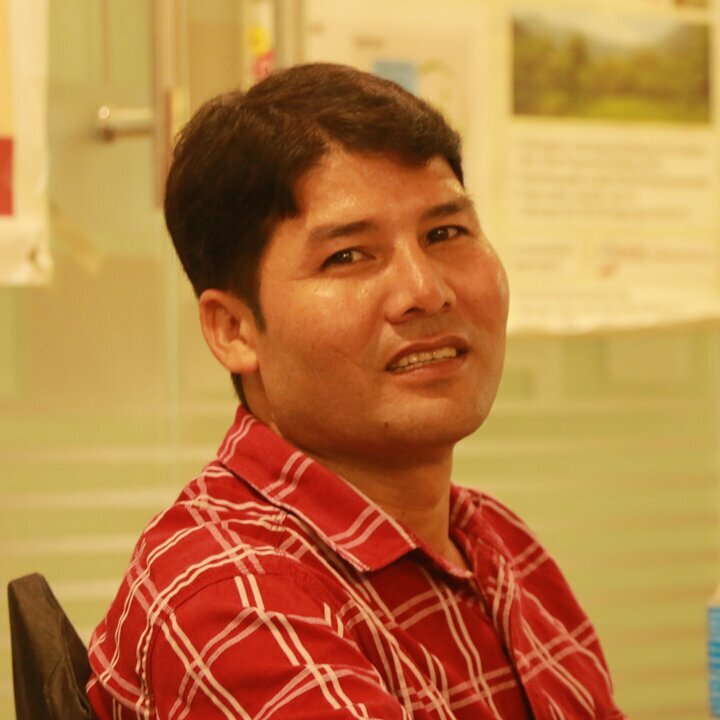 I am Bir Bahadur Hamal. I work as an organic agriculture campaigner and I am one of the Rural Service Providers for NMA project at Banke district. Banke district is one of the important market hubs in mid - west Nepal. Farmers in Nepalgunj originally used manure from their cows and buffaloes to fertilise their crops. With influx of migrants to the area, land holdings became smaller, and farmers had more difficulty supporting livestock. With government support, they switched to chemical fertilisers which decreased soil quality, making crops require more water. This is a problem, particularly in dry season; we do not have irrigation here and farmers use wells to get water; now they are having to dig wells deeper and deeper as the level of water in aquifers have decreased. As farmers have switched to growing more for cash than for consumption, production and consumption of fruits and vegetables is also declining, and now most farmers depend on the market for their supply of fruits and vegetables. Almost half of all our produce comes from India, and so we feel uneasy thinking that our food supply depends on Nepal’s relations with India. To help revive the diversity of crops produced and consumed locally, we developed a micro project to produce organic compost through vermiculture and promote home gardens. 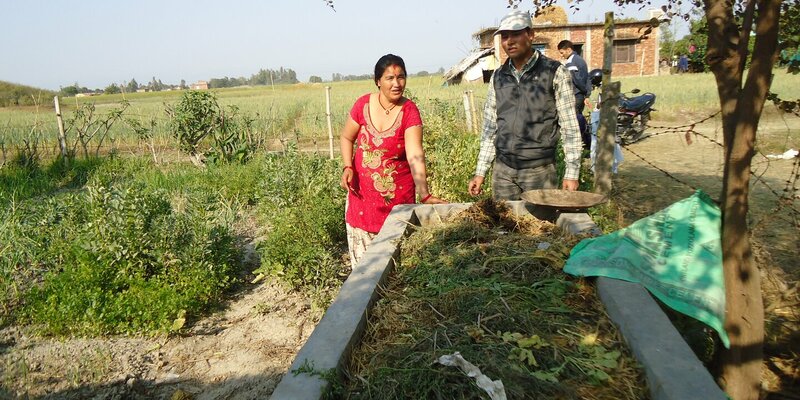 The project was piloted with 34 farm families living in wards 18 and 20 in Nepalgunj sub – metropolitan city. Before the NMA project, I worked in the UK NGO Find your Feet (FYF) in organic farming in India. I had piloted vermiculture in Sitapur (Banke). I saw the NMA project as a means to promote this idea. The project linked vermiculture more solidly to better nutrition. I gathered 34 farmers whom I knew to talk about the harmful effects of chemical fertilisers and gave a short orientation about the benefit of vermicompost. Community people were very concerned and interested. When I presented the idea of vermicompost and kitchen gardens to the District Agriculture Development Office (DADO), it was very supportive. The timing was right: It was the period when India blockaded Nepal (2016), and people were eager to feel more independent in food production. Also, the government had tested the produce from different places in Nepal (including a local market near here) and found that they were toxic. This got press coverage, so people were aware of the problem and the government increased its promotion of organic farming, publishing guidelines for vermiculture. It had not yet formulated guidelines for activity in the districts, so the Chief of the DADO was pleased that our micro project concept gave him a clear and acost-effective way to do his job. He gave us financial support (USD 900), and organized monitoring for the projects from the DADO Banke, Agricultural Department in Kathmandu and Regional Department Surkhet to a meeting to present the project. We developed criteria for selecting pilot participants, and worked jointly with DADO to train them. There was a high demand, which we could not meet with the funds we had. 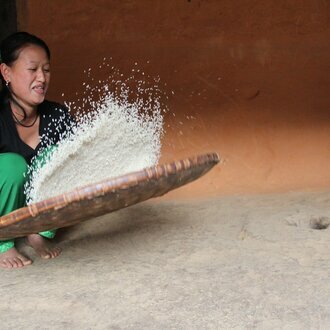 In addition to the HELVETAS Nepal and DADO budget, we asked farmers to co-invest NRs. 1500 each. With these resources we were able to provide the materials to build pits for producing vermi-compost and earthworms, as well as seasonal seeds for planting in gardens. We organised two training sessions on building the pits, developing vermiculture, and planting organic kitchen vegetable gardens. All 34 participating families have installed the pits and are now producing manure; they have all started kitchen gardens. Most have used the compost in their gardens already. They report that it works as well as chemical fertiliser; some have observed that the compost makes the soil moister so it needs less water, and that the vegetables grown in it taste better. 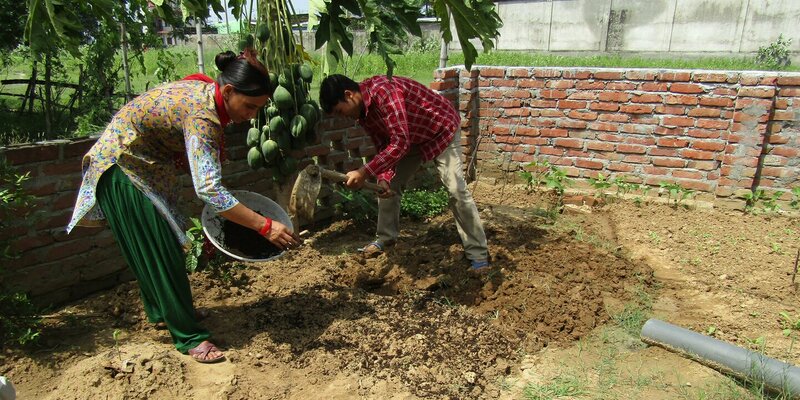 There are still challenges: the temperature in Nepalgunj exceeds the ideal temperature for vermicompost (during summer season), which is 25-30 degrees centigrade. Six farmers had their entire earthworms die from overheating, which we had replaced with the advice to cover the pit with thatch roof or grass to reduce the heat. One limitation is that in this area the soil is too water-logged for growing vegetables in rainy season, so the gardens can only produce vegetables in dry season. It would be good to find a technology that permits year-round production in the kitchen gardens. I think this micro – project influences community nutrition by increasing the supply of fruits and vegetables understanding their nutrition value. In this regard, my role is quite important. Additional training in agriculture and more technical backstopping would be very useful to me. The face to face meetings were the best part; they enabled us to share ideas and lessons learned, and improve project quality. The online platform is also good. I have used it and it is very helpful, especially the knowledge bank. After the project is over, I am quite sure that the farmers will continue their gardens, however they will need support and guidance to scale up.